This fairy door kit is laser cut from 2mm MDF and has an engraved grain effect in some of the door slats. It would make an ideal decoration to sit on top of the skirting in a child's bedroom. It will be supplied as a kit for you to paint (or leave natural) and glue the parts in place. The parts can also be held together with a piece of blutack if required. This MDF fairy door is suitable for indoor use, however if treated with a coat of varnish, it could be used to decorate something outdoors. As these parts are laser cut, there will be some slight discolouration of the edges, however these can easily be sanded out or painted over. The complete door measures 80mm x 100mm. 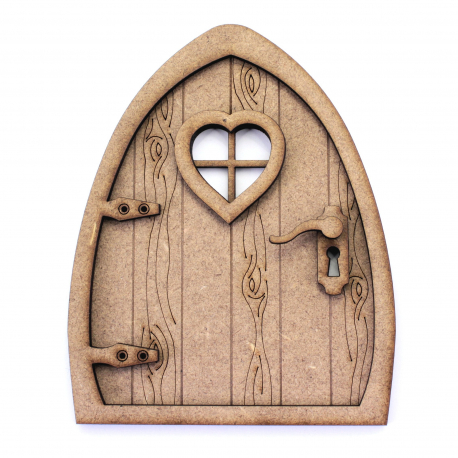 The parts included are door, door frame, heart window frame, keyhole surround, and handle. Please note that the hinges are not functional and that the door does not open.